Still riding the success of 1984’s A Nightmare on Elm Street, Wes Craven took on another form of supernatural horror with 1988’s The Serpent and the Rainbow. Anthropologist Dennis Alan (Bill Pullman) goes to Haiti to investigate an unusual case. Allegedly a Haitian named Christophe (Conrad Roberts) died but came back to life, so Alan investigates a drug that may have caused this occurrence. This leads him down the proverbial rabbit hole, as he gets deep into affairs in Haiti. Guided by local doctor Marielle Duchamp (Cathy Tyson), Alan enters with a skeptical view but finds himself confronted with a mix of episodes he finds hard to explain. Maybe I recall incorrectly, but I thought Serpent did okay at the box office in 1988. If we accept the figures on IMDB, it made $19 million, which sounds like peanuts but represented a profit given the movie’s $7 million budget – and almost doubles the surprisingly low $10 million earned by the much more famous Nightmare. I bring this up because Craven’s work immediately after Serpent makes me wonder if he viewed it as a flop. While Serpent demonstrated Craven’s desire to branch out from traditional horror, 1989’s Shocker offered a blatant return to the well, as it provided a virtual remake of Nightmare. When filmmaking experiments succeed, they tend to encourage directors to continue down new paths, not to return to the safety of the tried and true. Shocker apparently made less than Serpent, so I guess that didn’t work. In any case, I do appreciate Craven’s attempt to do something different with Serpent, but the end result seems less than enthralling. While touted as a supernatural horror movie, Serpent plays like a trippy film noir. Though he may be an anthropologist, Alan acts more like a detective who investigates the cause of Haiti’s “undead”. The film gives him the requisite cynical attitude and even gives Alan hard-bitten narration throughout the film. None of which suit Bill Pullman’s talents at all. I always wondered why Pullman never became a star - maybe he was too varied for his own good. Pullman made his movie debut with a supporting role in 1986’s cynical comedy Ruthless People, and that part catapulted him to the lead in 1987’s Mel Brooks parody Spaceballs. Rather than pursue more broad comedic parts, Pullman went for drama with 1988’s Accidental Tourist in addition to the supernatural horror of Serpent. Pullman’s career faltered after that – while he occasionally showed up in hits like A League of Their Own and Independence Day, he never turned into a star. Which I thought was something of a shame, though that made result from my residual affection for Ruthless People. I so love that movie – and Pullman’s dimwitted Earl – that I may view him as a better actor than he was. Looking at his other films, I find it tough to latch onto any performances that excelled. Serpent doesn’t offer something that makes sense for Pullman – indeed, the film seems so wrong for him that I don’t know what inspired his casting. While Pullman doesn’t play Alan for laughs, he comes across as somewhat goofy too much of the time, so I find it tough to take him seriously. He simply lacks the gravity and sardonic attitude required for the role, and he can’t pull off the scary moments either, as he just seems too broad and silly to convey terror. Pullman leaves something of a hole at the center of Serpent. What should come across as a dark, harrowing journey seems toothless because I don’t buy the lead actor. That said, I’m not all that sure how much better Serpent would be with a more suitable star. The film does manage some interesting elements, especially in the way it leaves the nature of its “zombies” up for grabs. Is there a legit medical explanation or is something supernatural at work? The movie tilts in one direction, but it gives us a legitimate question. Serpent also explores its themes in a moderately engaging manner. It can seem a bit random, but it still delivers occasional sequences that achieve the film’s goals. These are just too infrequent for my liking, though. Serpent has its moments, but it too often feels like a collection of creepy images without a lot of connective tissue. Though not a bad film, Serpent never quite gets where it needs to go. 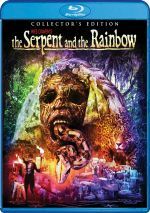 The Serpent and the Rainbow appears in an aspect ratio of approximately 1.85:1 on this Blu-ray Disc. I didn’t expect much from the transfer, so I was pleased by the pretty positive results. Sharpness was usually good. A little softness affected wider shots, but any lack of definition was typical for films of this one’s era. Overall clarity appeared solid. I saw no jagged edges or moiré effects, and edge haloes remained absent. Print flaws also failed to cause issues; I saw a couple of small specks but nothing more than that. With a fairly natural palette, the colors of Serpent worked pretty well. Though they occasionally showed some “80s murkiness”, I thought the hues generally came across as full and concise. Blacks were mostly dark and firm, and low-light shots offered reasonable clarity. No one will view this as a demo film, but given the era in which it was made, the end result satisfied. Similar feelings greeted the decent DTS-HD MA Stereo soundtrack of Serpent. Though a lot of the audio focused on the center channel, the mix managed to broaden to a moderate degree. This mostly contributed stereo music and general ambience, but some creepy moments used the speakers well. While the mix could have been more ambitious, it seemed satisfactory based on its age. Audio quality seemed dated but fine. Speech appeared reasonably natural and concise, with minimal edginess. Music presented more than adequate range and depth, and effects showed good clarity and accuracy. As with the picture, nothing here excelled, but the soundtrack held up well enough. A few extras round out the disc, and we open with an audio commentary from actor Bill Pullman. Along with moderator Rob Galluzzo, Pullman offers a running, screen-specific look at how he got the role, shooting in Haiti, his character and his performance, thoughts about cast and crew, stunts, and various other movie specifics. Overall, this becomes an engaging commentary. Pullman offers a lot of good notes about his experiences, and Galluzzo helps abet these memories. I find this to be a consistently solid chat. Note that the commentary ends at the 53-minute, 25-second mark. This seems a little abrupt but I still like the track, even if it doesn’t cover the whole film. The Making of The Serpent and the Rainbow runs 23 minutes, 57 seconds and features Pullman, author Wade Davis, director of photography John Lindley and special effects artists Lance Anderson and David Anderson. We learn about the source book and its adaptation for the screen, story/character areas, cast and performances, shooting in Haiti, cinematography, effects, and general memories. “Making” gives us a good collection of filmmaking notes, though I think it approaches the movie in a moderately scattershot manner. I also find myself perplexed at the description of Pullman as an “unknown” prior to Serpent when he’d already been in two prominent comedies. Despite these issues, “Making” still manages to deliver a positive overview. In addition to the film’s trailer and a TV spot, we get a Still Gallery. It offers 59 images that mix shots from the set and publicity materials. These add up to a good collection of photos. Partly due to ill-advised casting, The Serpent and the Rainbow provides an erratic supernatural horror film. I think it occasionally threatens to turn into something involving, but it sputters too much of the time. The Blu-ray presents generally good picture and audio as well as a decent batch of bonus materials. Serpent seems like a fairly mediocre movie to me.